Identifying shorebirds can be a challenge--and having a field guide specifically devoted to the species gives any birder an edge. Yet until now, no guide has illustrated or described the complete range of North and Central American shorebirds. Dennis Paulson's book more than corrects that deficiency. This beautifully illustrated volume represents the first complete guide to North and Central American shorebirds ever published. 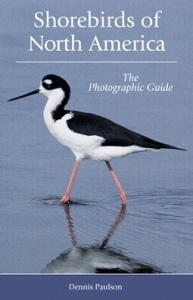 Unlike other guide books, which have traditionally relied on paintings to represent shorebirds, this one contains an extensive series of striking photographs--most never published before. More than 530 photos illustrate all shorebird species in their varied plumage, and are accompanied by text that points out the variation within common species. The book also includes identification tips and ways for distinguishing shorebirds from all similar species, at rest and in flight. Brief descriptions of voice, behavior, habitat, and range are given for each species. 'This is an excellent, well executed publication and easily meets the high standards set by Dr. Paulson's previous books. For those of you that are up to the challenges of mastering shorebird identification, this is a definite, must-have addition to your library.' - Andy Stewart, British Columbia Birds.